You have a few options for Battlefield Hardline Server Hosting. EA does not open up available hosting to all providers and only the top known providers with the best hardware and network are allowed to host Battlefield Hardline servers. Here is our list for the best battlefield hardline server hosts. All of the hosting providers listed offer the standard addons of voice server (mumble, vent, or teamspeak), Clanpay System, and 24/7 support. Some are better than other in these areas but the base features will always be their. 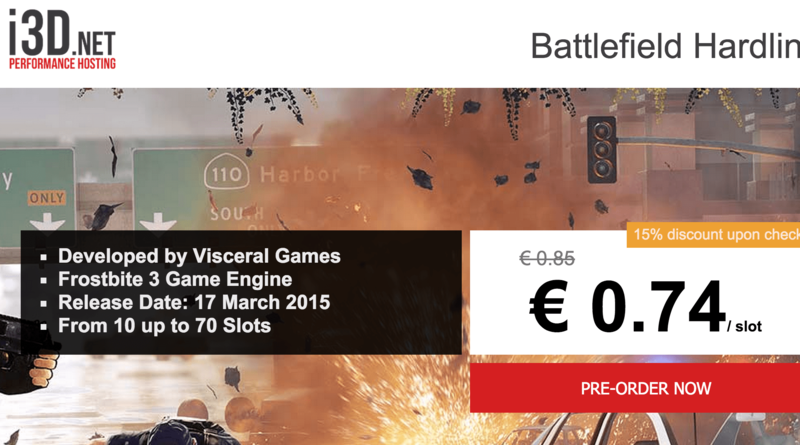 GameServers.com is our number 1 choice for battlefield hardline server hosting. They have a global network and have been partners with EA products since the beginning. They have the best track record of uptime and server hardware of all the game server providers. Pricing is very comparable to other providers as EA controls a lot of that aspect. If you want a stable server with almost perfect uptime Gameservers.com is the way to go. The best thing about hosting your battlefield hardline server with gameservers.com is that you get a dedicated cpu core for your server. This small but crucial change allows your server to run at the best performance always. Other providers do not have this feature standard and will charge extra for it (+~$15/month is normal). I3D.net is a newer host to gaming servers but so far has had a good reputation amongst gamers. They are a Europe based provider so you will have to pay the VAT tax on top of the normal fee. For some this makes them a no go for battlefield hardline server hosting but for many Europeans they are happy to pay the tax as it supports their healthcare and public transportation system which most use. Overall I3D.net has a great track recommend and even with the VAT tax are very comparable on price to gameservers.com. Multiplaygameservers.com is a provider that seemed to come out of no where in the past couple years. They offer battlefield 4 harline server hosting for a bit more than their competitors and seem to have great reviews from their clients. MGS has a world wide network and if you are looking to get your server as close as possible to your current location you may want to take a look and chooses between each as they all seem to be using different datacenters for their game hosting. Purepings offers bf hardline server hosting at a fair cost. They are a bit more then our number 1 pick gameservers.com but do offer an excellent package for the price. They offer one of the larger size voice servers of the game server hosting companies, coming in at 25 slots free. It is a mumble server though which some gamers do not like. For a fee you can get a teamspeak or vent server as an option. For any small clan that wants to have their own battlefield hardline server a 25 slot mumble voice server would be fine.